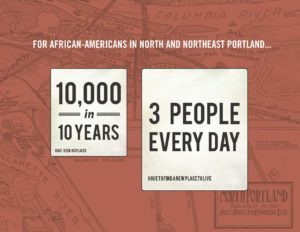 During the period from the mid-1990’s to 2010, 10,000 residents—primarily African Americans—were forced to relocate out of North and Northeast Portland neighborhoods. Essentially, 3 people every day for 10 years were forced to find another place to live. “We cannot undo the harms done, but rather must focus on restoring housing justice for those who were harmed,” said PCRI Executive Director Maxine Fitzpatrick. PCRI’s goal is to support and encourage displaced African-Americans to focus on the future. Homeownership is the stabilizing solution to displacement. Investing in opportunities and assistance for low-income families ensures long-term affordability and stabilizes residents in their neighborhood. The 1,000 homes will be constructed at a level of 100 homes per year over the next ten years. PCRI is targeting involuntarily displaced residents who were forced to relocated due to escalating housing costs, or because their rental home was sold to a homeowner. PCRI encourages interested community members to participate and learn more via PCRI’s website and social media channels.